A new study published in journal Nature, done by Yale University researchers, explains how a common ingredient in many vaccines stimulates and interacts with the immune system and give protection against very many infectious diseases. Vaccines must possess not only the bacterial or viral components that serve as targets of protective immune responses, but also ingredients to kick start those immune responses. In many vaccines, the bacterial or viral components themselves have this capability. For other vaccines, the immune system requires an added boost. Adjuvants are those substances added to a vaccine to help stimulate the immune system and make the vaccine more effective. Currently the only vaccine adjuvants licensed for general use in the United States are aluminum hydroxide/phosphate formulations, known as alum. Although alum has been used to boost the immune responses to vaccines for decades, no one has known how it worked. Alum stimulates clusters of proteins called inflammasomes, found inside certain cells. These inflammasomes respond to stresses such as infection or injury by releasing immune cell signaling proteins called cytokines. 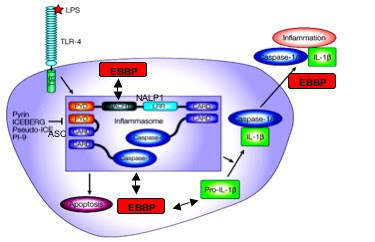 Inflammasomes are a component of the innate immune system that operates in parallel with, but separate from, Toll-like receptors, also part of the innate immune system. There are still many unanswered questions such as how activation of this pathway controls a highly specific and long-lasting immune response generated by a vaccine. via Nature.